Consumers are quickly adopting supplements to maintain their well-being in an effort to keep their health costs down. Between 2014 and 2015 alone, global supplement sales grew an impressive 8 percent to $88.3 billion, with continued increases anticipated. Probiotic supplement use is expected to ride along this wave of growth. 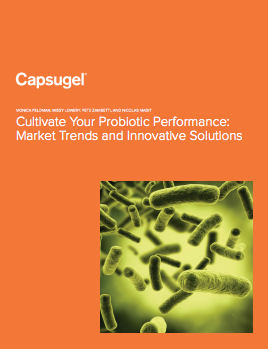 To provide insights into the global probiotics market, this report analyzes regional trends and explores how consumer education, government regulations, probiotic forms, wellness claims and effective delivery systems can help cultivate probiotic performance in the coming years.